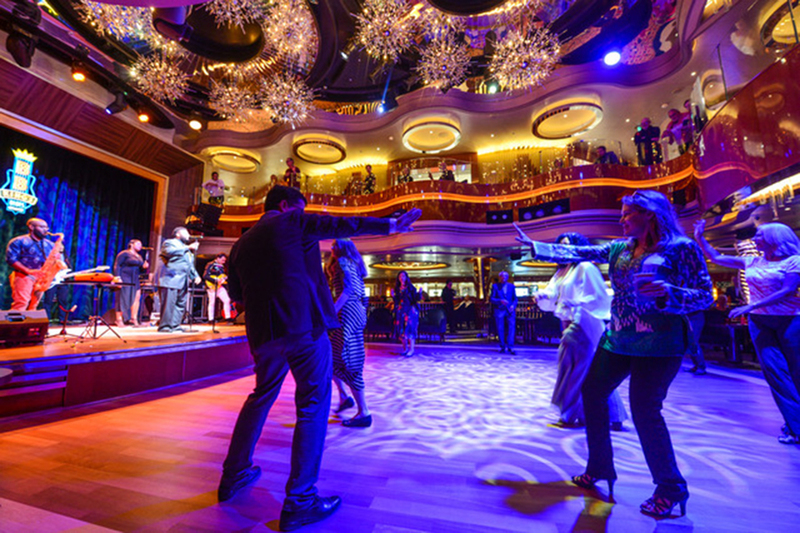 Holland America Line’s lovely Nieuw Statendam, second ship in the brand’s Pinnacle Class was christened by Oprah in early February and now sails the Caribbean. Sister to the much admired Koningsdam, this ship is just as beautiful. The highly regarded onboard cuisine in specialty restaurants is exceptional and sophisticated. Alternative restaurant, Rudi’s Sel de Mer, an à la carte seafood brasserie, is spectacular in every way – the cuisine and décor – as well as its wide-ranging menu. Rudi Sodamin is the long-standing master chef and head of the Culinary Council for Holland America and Sel de Mer is now eponymous with this talented chef. 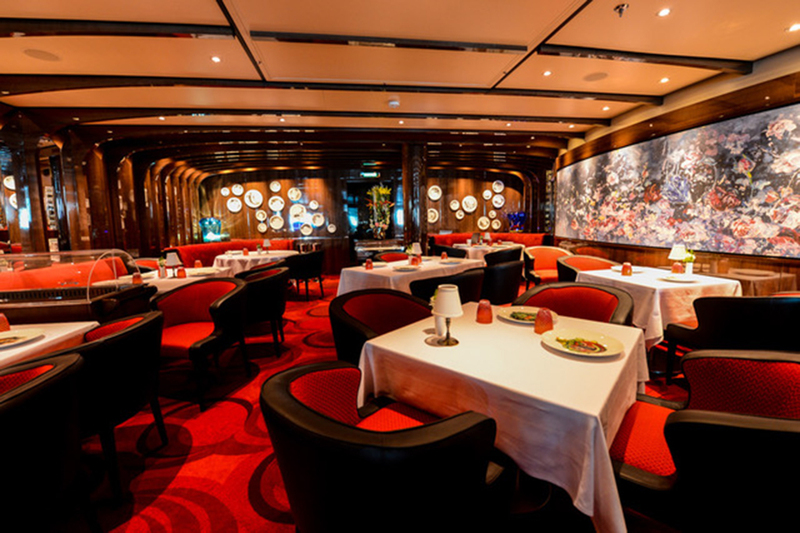 On other HAL ships, Sel de Mer is a pop-up in the Pinnacle Grill one night per cruise. Rudi’s Sel de Mer. Photo by Tim Boyles. Tamarind is the gorgeous Asian fusion restaurant with a separate Nami Sushi Bar by Master Sushi Chef Andy Matsuda, who provides innovative recipes; reservations required and a charge for dining. The food is impressive everywhere – ranging from made-to-order pizza at the pool area, to the main dining room and Canaletto for Italian with its elegant décor in a specific area of the Lido Market. The Lido itself is lovely and spacious with a number of stations, all with good food and service. It’s the music, however, that makes this HAL ship a stand-out and the addition of the Rolling Stone Rock Room – in partnership with the magazine – is a massive hit. Packed every night for each of the three sets, the audience loves this spot along Music Walk with guests singing, dancing and clapping along. The house band makes great sound and plays favourite tunes including the Eagles, John Mellencamp, the Stones, The Band, CCR and more. The Rolling Stone Rock Room. Photo by Tim Boyles. Across from the Rock Room are the dueling pianos of Billboard Onboard with audience requests happily received and then down the hall, the B.B. King’s Blues Band belts out three sets most nights too – spectacular voices singing great soul and blues. Lincoln Center Stage performs during the day or early evening from this same venue. In the main theatre, you may find an opera performance or a Spanish guitar foursome and the World Stage offers great production shows and special evenings in conjunction with BBC Earth. Nieuw Statendam is an elegant, modern explorer and the epitome of design with a beautiful musical theme; there are many favourite spots for repeat guests and an eye to the future for new-to-Holland America cruisers. Originally published in Cruise and Travel Lifestyles, Winter/Spring 2019 edition. Main photo courtesy of Holland America Line.